Rold Gold Pretzels from Frito Lay. 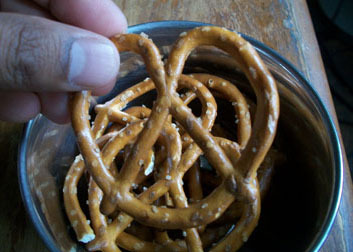 I forgot how tasty simple pretzels can be. First of all, the name of this blog being RoodonFood, I appreciate the silly brand spelling. It feels like a throwback. The bag was $3.29 for a full pound so there are plenty to share. You get a satisfying crunch and nice texture. They’re quite salty but that’s half the fun of a pretzel. The size is reasonable, fitting nicely in my palm. They’re deceptively light so in a weak moment you may be tempted to pick up 3 at a time and stuff them into your mouth. I maintained composure and dipped them one at a time into guacamole and hummus (not at the same time). It’s worth noting that these are low fat for those concerned with such things. Also available are Cheddar, Bagel, Sourdough, Honey Mustard among others. I’d definitely get these again but there are so many in the bag that it’s going to be a while till the next purchase. Mental note – next time I’ll pick up some nutella to dip them in.